COMMENTS: If the last episode was Frank alienating Claire this episode is Frank alienating Jackie. The writers seem to be following the classic buddy movie trope of having the antagonist alienate all his friends in act two before winning them back in the third. Or will he? I suspect it's too late to see the implications of Claire's alienation in this series, and if there is to be a season four, this makes me think he will triumph over Dunbar in the primaries....unless there is an epic twist. 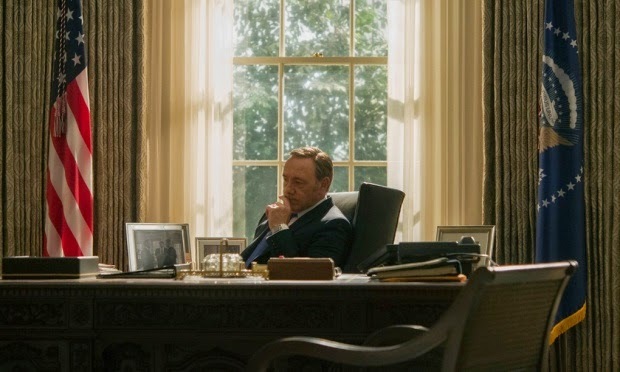 Overall, though, this is exactly the kind of HOC episode that I like, and the scripting of the debate was a tour de force. PLOT SUMMARY: Frank and Jackie Sharp prepare their one-two strategy to demolish Heather Dunbar at the the Debate. But Jackie is worried she's taking too much flak and meets secretly with Dunbar offering to endorse her rather than Frank in exchange for Secretary of Defense. Dunbar refuses to play ball. During the debate it seems like Jackie Sharp is defeating Dunbar, but when Sharp goes too far in questioning Dunbar's fitness as a mother, Frank ultimately goes in for the kill, revealing that Jackie's step kids go to private school. The polls therefore give the win to Frank. When Jackie complains he chews her out and in retaliation she declares for Dunbar while Remy also resigns. Claire passes out giving blood & Tom tells Frank she was talking about potentially calling time on the marriage every seven years. Elsewhere, Gavin Orsay tells Doug Stamper that Rachel isn't really dead - he just said that to get his passport - and once all the charges are dropped he'll tell him where she is.